Often called just fossa, this is one of Italy's more unusual and 'extreme' cheeses, made of sheep's and or cow's milk. 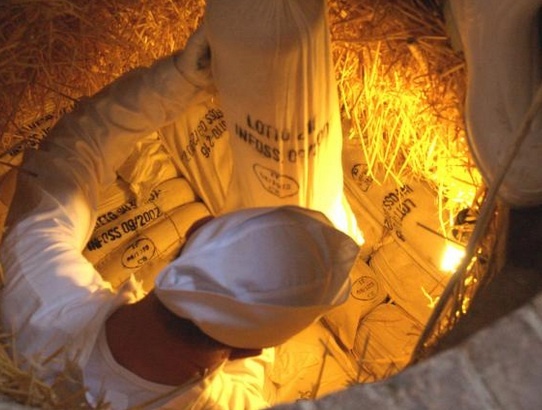 After 30 days of normal ageing, the cheeses are placed in canvas bags and lowered into pits dug in the local gypsum in the Middle Ages (the custom is said to have originated from the locals' need to hide their cheese from the numerous marauding armies that passed through; at some point there was a eureka moment that the cheese improved after spending time in a hole). The pits, 10-30ft deep were prepared in August with fires to sterilize them and eliminate excess humidity, then lined with fresh hay, to maintain a constant temperature of 21C (70F) and the humidity of 90%. On 26 November, St Catherine's day, the cheeses are traditionally removed, ready to eat. Irregular in shape, it has a pungent aroma, reminiscent of the forest floor, and hints of truffle and event mildew. It's often grated over pasta, or eaten in a piadina, or served on its own with honey. Formaggio di Fossa di Sogliano, made in Sogliano al Rubicone, is DOP. In early December, the village holds a Fiera del Formaggio di Fossa. Another tasty fossa to look out for is Ambra di Talamello.